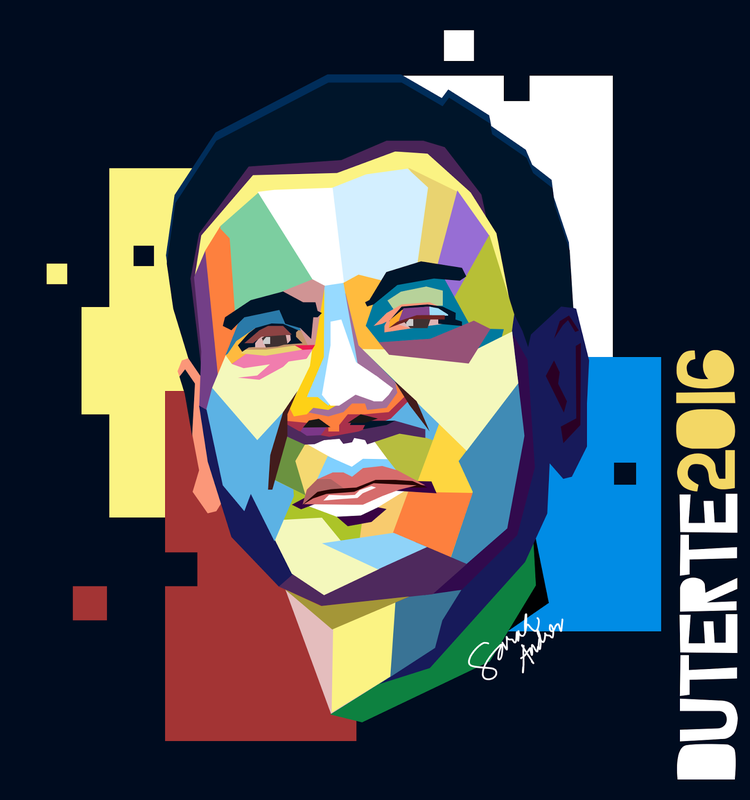 First WPAP Art: Duterte 2016 - Life is so full of tae! Last week, a friend asked me to create a vector art of our dear Mayor Rody Duterte to support her advocacy in encouraging him to run for Presidency. Okay, I'll be honest with you. I really don't like the idea of him running for President. You see, I, for one, love him so much that we don't want anything bad for our dear Mayor. See? It would not be an easy task. But if there is no other person who could go on par with his level of competency for the highest position in the government, then I'd definitely get myself registered again and vote for him as our leader (that is, if he runs). I just hope Philippines is ready for his leadership. I hope the Filipinos know what they're getting into when asking for the iron fist to rule the nation - because that entails a lot of discipline. There is no way he can do this alone. If you want change, it will have to start with you. Anyway, I did not create a vector art. I'm too preoccupied these days. I've got a logo to create for our business, a new design job for an app, and a lot more. Hence, I created a WPAP thinking it will just be easy. But I was so wrong. It took me a week to complete this. I've had a lot of stops in between and there were those times when I think of quitting because I really have no idea what direction I'm aiming for. Haha. Wedha Abdul Rashid has worked as an illustrator for the press industry since the 1970s, developing portraits of important figures from all backgrounds: politicians, musicians, artists, and fictional characters. Nailed it! Nice one. Murag dili first time. Haha. Thanks! Need to practice. Lingaw sya pero kapoy. me to maam, can I use it also for my tshirt? That is awesome. Doesn't look like it's your first time dear. Hi Nick! Sure you may! I think my friend also used this to print for her advocacy. Just hit me an email and I can send you a hi-resolution of this image without my signature. You can find my email at the Contact page. You really are talented! Are you sure it's your first time to do it? Great artwork! Make more! hi miss sara. i email you about this one. i hope to get a version for print also.it's only a matter of days before Duterte announces his candidacy. this is cool and i want to distribute shirts here as a way of showing him our support. thank you for this. you are awesome! Di na ko matingala. Amazing ka. Can I say the same? Sure ka first time ni nimo? Hahaha. Kinsa nagpaprint ani? Paapil ko bi. Haha. Buing! Wala pa ko kita sa actual shirt. Si princess nagpaprint ani. Mangayo pud gani ko. Pero I doubt na sul-obon nako, murag di man jud sya mudagan. Hehe. Hello, Miss Sarah. Good day! This is awesome. I love it! You are very talented. Can we get a copy too? We'd like to print this for posters and this looks cool on t-shirts too. I hope to hear from you. Thanks! Ang cute ng name ng blog mo. hehe.. Anyway, I'm from QC but I've been to Davao and I really love it there. I felt safe when I was there and I really admire the cleanliness of the City. My husband and I wish Duterte to run for a higher position in the government, we just believe that he can do more if he gets elected. Nice art though. Thank you! :) Actually, I still don't want him to run for President (selfish noh?) haha. But yes, I do believe in him, it's just that I don't believe in the people. He has a different way of ruling and I don't think people are ready for that. Thanks for dropping by! Hi, are you sure you're new at this? You nailed it though! I have close relatives in Davao but I've never visited them haha. Maybe it's high time I did one of these days! is it really your first time? great job! For me, when you are really happy doing something, there's a hint of what & who you are ---and that is passion and I like it! Can I share the WPAP to my group Dabawenyo Ka Kung? WPAP looks cool. Very colorful ang arts. You dud good on your first WPAP. I bet next time will be better, just keep practicing. And will vote for Duterte for president. This is a very interesting form of art. You should go on doing it as it appears you have the natural inclination towards it. Thank you! :) It is interesting indeed. wow, you did great at it. Oh, I love Duterte!!! Sana tumakbo syang Pres this election. He's the reason why my husband and I registered to COMELEC. haha. 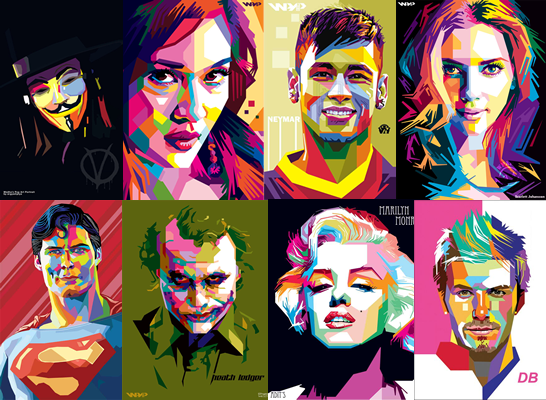 I want to make a family portrait at wpap-art or make one for my friends and have it printed and send as gift. Go! That is a great idea! This is a new kind of art that's interesting as it's made of single lines and strong colors only. I love how it looks like paint. How long does it take to finish one WPAP like that you made? I like Duterte because f what he did to Davao but it is now a bit confusing if he wants to be president or not. Nice art work! Regarding Duterte, i've only heard good things about him, but not so much to trust him. I hope there will be time for people to know enough about the candidates this coming election to be able to choose wisely. This is so amazing, i had to look closely and see how it was done. What software are you using? On the other hand, I will definitely vote for president if he will run. ang galing! naghahanap ako ng artwork ni duterte at ito ang pinakanagustuhan ko. sayang at di na sya tatakbo. pero pwede ko bang gamitin na dp ito dahil di pa ako nawawalan ng pag-asa na tatakbo sya ngayong halalan. Can I ask a copy para magpaprint ko karon? Nia man gud c Chiz ug Poe dire sa among school karon sa Butuan. really appreciate your art. i intend to print this for personal use to support mayor duterte. may i ask permission from you ms sarah. Hi. I loved your artwork! Can I use it to print them on the shirts? The shirts will be distributed to my relatives in other parts outside davao. This is my little way of helping out for Mayor's candidacy. Thanks in advance. Hi Ms. Sarah salamat sa pag gawa mo ng art kay Mayor Duterte. I used your art as a soladiraty filter in my FB account. sana ok lang sayo... salamat uli. Hi SArah, I really like your layout. Pwede ko mangau ug copy ani. Ready to print na for t-shirt format. Personnal collection ko lang. Hi Sarah. I love your art design. Can i use it for shirt printing here in Manila? just for personal use. please email high-res to umali_eric@yahoo.com. Thanks much! Hi. Pwede gamiton ning design nmo? Can i get a softcopy of this design. I want to print this on t-shirt for me, my family and everyone else who want. Not for business but to campaign RRD. Hi Ms. Sarah! I hope you don't mind but I also used your WPAP art as T-shirt design for myself and my husband. Hi Ms. Sarah, your work is great!!! ask naman po, sana ng high res, kasi gamitin namin to para po sa aming Duterte Supporters here in Bataan.... here is my email po joanne_aboganda@yahoo.com... GOD BLESS! I already sent you an email! Permission to use your graphic image of Duterte for printing into our shirt's for personal use. Mam can i have the permission to copy your art? For t shirt printing?